Tumor necrosis factor (TNF)-α is produced by cells of the immune system and is a key mediator in immune and inflammatory reactions. Through interaction with widely expressed receptors (TNF receptor 1 and TNF receptor 2), TNF-α is able to orchestrate the expression of a range of downstream proinflammatory molecules. Over the past decade novel biologics that inhibit TNF-α have been developed as extremely effective treatments for rheumatoid arthritis. Structurally, these biologics are antibodies, or TNF receptors on an antibody backbone that bind TNF-α directly and are delivered to patients by repeated injection. Gene therapy offers an improved approach to delivering biologics as a single administration of their encoding genetic material. In the present study we demonstrate the therapeutic effect of a small molecular weight dimeric TNF receptor 2 (dTNFR) constitutively expressed from plasmid DNA, delivered intramuscularly with electroporation, after disease onset in a collagen-induced arthritis model. Regulated promoters that enable the production of a transgene to be controlled are more suited to the application of gene therapy in the clinic. Regulated expression of dTNFR from the plasmid pGTRTT was also therapeutic in the mouse collagen-induced arthritis model when the inducer doxycycline was also administered, whereas no therapeutic effect was observed in the absence of doxycycline. The therapeutic effect of dTNFR expressed from a constitutive or regulated plasmid was dependent on the degree of disease activity at the time of DNA injection. The observations of this study are considered with regard to the disease model, the magnitude of gene regulation, and the path to clinical application. Rheumatoid arthritis (RA) is a widespread (prevalence 0.5–1%), chronic inflammatory disease that is localized primarily in the joints and has several pathological features of autoimmune disease. The disease is characterized by cellular infiltration in synovial tissue, pannus formation, and both cartilage and bone erosion. The cytokine profile of RA joints reveals an abundance of macrophage and fibroblast cytokines such as tumour necrosis factor (TNF)-α, IL-1, granulocyte–macrophage colony-stimulating factor and IL-6, along with smaller amounts of T-cell products. TNF-α has proved pivotal among these cytokines, and the development of protein-based anti-TNF-α therapeutics, including Remicade® (Centocor Inc., Malvern, PA, USA) and Enbrel® (Immunex Corporation, Thousand Oaks, CA, USA), which inhibit joint inflammation and prevent joint destruction, represent a significant advance in the treatment of RA . Importantly, they have proved effective in a high proportion of patients who do not respond to other therapies . Drawbacks to these protein therapies are the requirement for repeated administration by injection and the high cost of treatment (US$13 000/patient per year). We previously constructed dTNFR, which is a smaller inhibitor of TNF-α than existing biologics and consists of two extracellular subunits of the human TNF receptor TNFR2 connected by a short flexible serine glycine linker . This molecule inhibits TNF-α in vitro  and has been shown to inhibit disease when delivered before onset in arthritis models  and was also therapeutic in a model of multiple sclerosis . Gene therapy is potentially an improvement on protein therapy. Following the appropriate delivery of genetic material, the body's own cells are able to produce a protein therapeutic. Delivery of genetic material can be achieved with viruses such as adenoviruses, which give transient high-level expression of transgenes and have been widely applied in gene therapy in experimental RA models. Alternatively, retroviruses that integrate transgenes into the genome of dividing cells have proved effective tools in experimental ex vivo strategies in arthritis models . The initial enthusiasm for viral vectors as candidate vehicles for gene delivery was tempered by safety concerns in clinical trials: first the death of a patient following administration of adenovirus ; and second the development of leukaemia in severe combined immunodeficient patients who received retrovirally transduced haematopoietic stem cells . Plasmid DNA isolated from bacteria has no innate mechanism of cell entry or propagation, and does not encode accessory proteins or integrate into the genome, but it has the potential to be an efficient vehicle for gene delivery in vivo when administered by intramuscular injection. First reported by Wolff and coworkers in 1990 , injection of plasmid DNA into mouse skeletal muscle results in long-term (at least 2 months) transgene expression. More recently it was shown that when muscle was electroporated after DNA injection the efficiency of transfection was further enhanced by a factor of 100-fold, with transgene expression persistent up to 1 year . Plasmid DNA also has the advantage of being very stable and both easy and cheap to produce in large quantities. Ideally, gene therapy for a chronic disease such as RA will permit long-term production of a therapeutic molecule, so reducing the need for repeat administration. In combination with regulated promoter systems, therapeutic levels of a molecule are produced, so avoiding excess (toxicity) and inadequate (no effect) production, and this also provides a means by which to terminate expression in the event of adverse effects. Principal among the transcriptionally regulated systems that have been developed are the tetracycline 'off' , 'on'  and 'repressor'  systems, and the ecdysone , rapamycin  and streptogramin  systems, which are all two- or three-component systems that utilize a small molecule to regulate the activity of a responsive promoter (for review ). The tetracycline regulated systems have the inherent advantage that tetracycline and several derivatives have well defined pharmacokinetics and pharmacodynamics . We and others previously combined the components of the tetracycline 'on' system into a self-contained autoregulated plasmid vector . In the present study we constructed plasmids encoding dTNFR from constitutive and regulated promoters, from which the expression of dTNFR was characterized in vitro. Function of the vectors was demonstrated in vivo after intramuscular delivery, and we examined the therapeutic effect of dTNFR expressed constitutively or in a regulated manner from plasmid DNA administered after the onset of disease in the mouse collagen-induced arthritis (CIA) model. The vectors pGT, pGTL, pGTE, pGTRTL, and pGCMV were previously reported . The construct pGTTRD, which encodes dTNFR from a Ptet, was constructed by removing the dTNFR sequence from the construct pTRIP  by restriction with NcoI filled in with Klenow, and cut with XbaI, and inserting it into pGT restricted with EcoRV and XbaI. The self-contained regulated plasmid pGTRTT encoding dTNFR was then contructed by removing the Ptet–dTNFR cassette from pGTTRD by restriction with Nhe1 and PflMI and ligating it into pGTRTL restricted with the same enzymes. The plasmid pcdTNFR, in which dTNFR is located downstream of a cytomegalovirus promoter, was constructed by removing the dTNFR gene from pGTTRD by restriction with HindIII and XbaI and inserting it into pcDNA3 (Invitrogen, Leek, The Netherlands) restricted with the same enzymes. 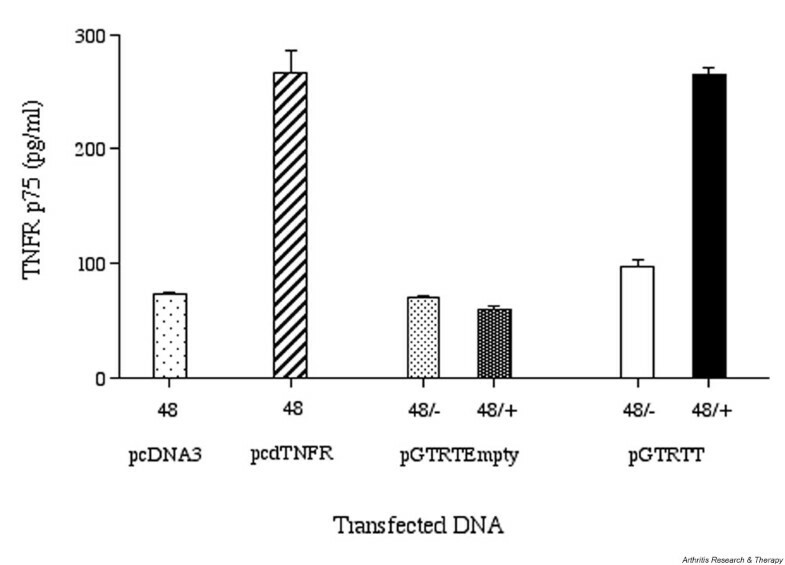 A control construct pGTRTEmpty was also prepared, which retained all the elements of pGTRTT except the dTNFR gene. pGTRTE is an autoregulatory plasmid from which enhanced green fluorescent protein (EGFP) expression is regulated, and it was constructed by removing the Ptet–EGFP cassette from pGTE by restriction with XhoI and PflMI and inserting it into pGTRTL restricted with the same enzymes. The EGFP gene was removed from pGTRTE by restriction with ClaI and re-ligation of the plasmid formed pGTRTEmpty. The plasmid pcLuc+, which encodes luciferase from a cytomegalovirus promoter, was constructed by removing the improved luciferase gene (Luc+) from pGL3 Basic (Promega Corp., Madison, WI, USA) with the restriction enzymes XhoI and XbaI and inserting the gene into pcDNA3 restricted with the same enzymes. Plasmids were expanded in Escherichia coli DH5α except autoregulatory vectors, which were propagated in E. coli DH 21. Plasmid DNA was purified using the Plasmid Mega Kit (Qiagen Ltd, Crawley, UK), or when required for injection into mice the EndoFree™ Plasmid Mega Kit (Qiagen Ltd) was used. All plasmids that were used in expression studies are depicted schematically in Fig. 1. Expression plasmids used in this study. Numbers in parenthesis represent the length of each vector in base pairs. , SV40 early/late poly A signal; , β-globin poly A signal; , downstream SV40 untranslated region. CMV, immediate–early enhancer/promoter; dTNFR, dimeric human tumour necrosis factor receptor 2; Luc, luciferase gene; Luc+, improved luciferase gene; Ptet, tetracycline responsive promoter; rtTA, reverse tetracycline transactivator. Cos-7 (SV40 transformed monkey kidney fibroblast, ECACC cat. no. 87021302) cells were cultured in Dulbecco's modified Eagle's medium (BioWhittaker, Wokingham, UK) supplemented with 10% foetal calf serum (Gibco BRL, Paisley, UK), glutamine (2 mmol/l; BioWhittaker), penicillin (100 U/ml; BioWhittaker) and streptomycin (100 μg/ml; BioWhittaker). Transfections were performed using the calcium phosphate precipitation method used previously . Cos-7 cells were plated on 12-well plates at a density of 0.4 × 106/well and were transfected the next day with 2 μg DNA. Cells were subjected to an osmotic shock on the second day, after which fresh media was added with or without doxycycline at a concentration of 1 μg/ml. Supernatants were collected 24 or 48 hours later and levels of dTNFR were determined by ELISA. Mice were treated according to approved UK Home Office and institutional guidelines. Naïve or arthritic DBA/1 mice were injected intraperitoneally with the muscle relaxant Hypnorm™ (Janssen Animal Health, Janssen Pharmaceuticals, Beerse, Belgium) and were anaesthetized with halothane (Concord Pharmaceuticals Ltd, Dunmow, UK) using Boyle's apparatus (British Oxygen Company, London, UK). The fur covering the right quadracep was shaved and the exposed skin sprayed with disinfectant. Endotoxin-free plasmid for injection was prepared in a solution of 0.9% NaCl at a concentration of 250 μg/ml for reporter gene studies or 833 μg/ml for therapeutic studies. DNA (20 μl) was injected intramuscularly at three sites, and Camcare ECG gel (Camcare Gels, Mepal, UK) was then applied to the surface of the skin. Caliper electrodes 384L (BTX Instrument Division, Harvard Apparatus Inc., Holliston, MA, USA) were applied transversely across the quadriceps and the muscle was electroporated with four pulses at 200 V/cm and 20 ms duration at a frequency of 2 Hz using a BTX Electro Square Porator ECM 830 (Harvard Apparatus Inc.). The polarity of the electrodes was then reversed and the procedure repeated. Regulated expression of luciferase from pGTRTL was assessed in DBA/1 mice following intramuscular injection and electroporation. 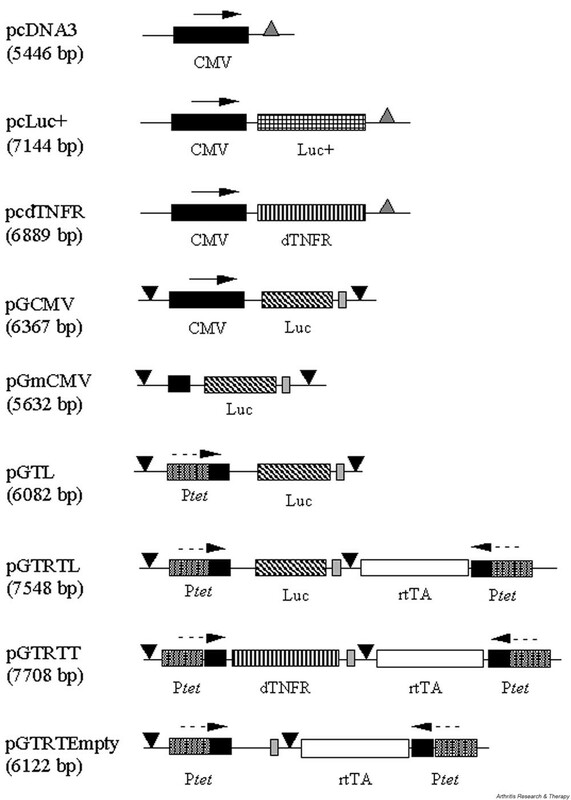 Expression of luciferase was compared with control plasmids pGmCMV, pGTL and pGCMV. Plasmid DNA was injected intramuscularly into 10- to 12-week-old naïve DBA/1 mice along with electroporation. Luciferase expression in control groups was assessed 4 weeks after DNA injection, when animals were killed and muscle tissue was snap frozen until further processing. The plasmid pGTRTL was injected into 30 mice, which were divided into six groups of five animals. These mice received normal drinking water for 2 weeks, and then two groups were given distilled water containing 10% sucrose, three groups drank doxycycline 200 μg/ml and one group was given doxycycline 2 mg/ml; the doxycycline solutions were prepared in distilled water containing 10% sucrose. All drinking bottles were wrapped in aluminium foil and were renewed every 2–3 days. After a further 2 weeks a group of animals from each treatment group was killed and the quadriceps muscles dissected and snap frozen. In order to analyze the reversal of gene induction from pGTRTL following the removal of doxycycline, a group of animals that had received doxycycline 200 μg/ml were switched to the sucrose drink. Three days later the remaining mice were killed and muscles collected as for the others. Luciferase activity in transfected muscle was determined using the luciferase assay system (Promega Corp.). Quadriceps muscles dissected from treated mice were snap frozen and stored at -70°C. Frozen muscle was processed by a method similar to that described by Hartikka and coworkers . Briefly, they were first crushed in a freezer mill (model 6750; Spex Centriprep Inc., Metuchen, NJ, USA) and the powder was transferred to an Eppendorf tube containing 0.5 ml reporter lysis butter. The suspension was then subjected to three rounds of freeze thawing, followed by 15 min of vortexing at 4°C. Samples were centrifuged (13 000 rpm for 5 min) and the lysate collected; pelleted material was resuspended in a second aliquot of lysis buffer and was subjected to the 15 min of vortexing followed by centrifugation. The second lysate was combined with the first and luciferase activity was determined in a 20 μl aliquot of the sample, which was automatically mixed with 100 μl of luciferase assay substrate, and light emission measured using a MLX Microtiter® Plate Luminometer (Dynex Technologies Inc., Chantilly, VA, USA). Protein concentrations of muscle lysate were determined using the Bradford protein assay (Bio-Rad Laboratories Inc., Hercules, CA, USA) and values for luciferase activity were expressed as relative light units per microgram of protein. DBA/1 mice aged between 10 and 12 weeks were administered Hypnorm™ (0.1 ml, intraperitoneally) and were shaved at the base of the tail. Bovine collagen type II (CII) was emulsified with complete Freund's adjuvant at a final concentration of 2 mg/ml, and a total of 0.1 ml was injected intradermally at three sites at the base of the tail. Twenty-one days later, a booster (0.1 ml) consisting of CII emusified with incomplete Freund's adjuvant (2 mg/ml) was injected intradermally across three sites at the tail base. A further 3 days later animals were injected with lipopolysaccharide (40 μg in 0.1 ml phosphate-buffered saline [PBS]; E. coli serotype 055:B5; Sigma-Aldrich Co. Ltd, Poole, UK) intraperitoneally to synchronize disease . The development and progression of arthritis was monitored every 2–3 days and was assigned a clinical score based on visual signs of arthritis (0.25 = swelling in a single digit; 0.5 = swelling in more than one digit; 1 = swelling and erythema of the paw; 2 = swelling of the paw and ankle; 3 = complete inflammation of the paw; the maximum score for each mouse was therefore 12) and the thickness of hind paws was measured using POCO 2T calipers (Krœplin Längenmesstechnik, Schlüchtern, Germany). Mice were monitored until 40 days after immunization, when they were killed and blood was collected for serum and draining lymph nodes were collected for assessment of stimulated cytokine secretion. Three days after injection of lipopolysaccharide (day 27), animals were assessed for development of arthritis. Animals with a clinical score of 0.5 or above were used in gene therapy experiments and were administered 50 μg of DNA intramuscularly in 60 μl at three sites and were electroporated utilizing conditions described above. Inguinal draining lymph nodes were removed from mice on day 40 after immunization. Incisions were made in the lymph nodes and cells were dispersed using a nylon cell strainer (70 μm; Becton Dickinson Labware, Franklin Lakes, NJ, USA). Cell suspensions were centrifuged and resuspended at 3 × 106/ml in Dulbecco's modified Eagle's medium supplemented with 10% foetal calf serum, glutamine (2 mmol/l), penicillin (100 U/ml) and streptomycin (100 μg/ml). Cells (6 × 105 cells in 200 μl) were aliquoted into wells in a 96-well microtitre plate and were stimulated with either CII (50 μg/ml) or ConA (2.5 μg/ml; Sigma-Aldrich Co. Ltd) for 48 hours, after which supernatants were collected and stored at -80°C until measurements of IFN-γ or IL-4 were performed by ELISA (see below). To measure levels of dTNFR, a microtitre plate was coated with 50 μl of a mouse monoclonal antihuman TNFR2 (R&D Systems, Minneapolis, MN, USA) at 4 μg/ml overnight at 4°C. Plates were washed with PBS and then blocked with 200 μl of 2% casein solution in PBS for 1 hour at room temperature. Plates were washed with PBS containing 0.05% Tween 20 (PBS/Tween) before incubation of standards (50 μl of human TNFR2 [R&D Systems] 1 pg/ml to 1 μg/ml) and samples (50 μl of serum or culture medium) for 3 hours at room temperature. Plates were washed extensively with PBS/Tween before incubation with 50 μl of biotinylated goat antihuman TNFR2 (R&D Systems) at a concentration of 100 ng/ml for 1 hour at room temperature. Signal was detected using the TMB microwell substrate system (Kirkegaard and Perry Laboratories Inc., Gaithersburg, MD, USA) and the reaction stopped by addition of 4 mol/l sulphuric acid (100 μl) and absorbance measurements were performed at 450 nm using an EL 312e microplate biokinetics reader (Bio-Tek Instruments Inc., Winooski, VT, USA). The detection limit of this ELISA was 10 pg/ml. In order to determine the immunogenicity of the dTNFR, an ELISA was also performed to measure antihuman TNFR2 in the sera from experimental mice. Microtitre plates were coated overnight at 4°C with 50 μl of human TNFR2 (2 μg/ml). Plates were washed with PBS and then blocked with 2% casein solution in PBS for 2 hours at room temperature. Plates were then washed with PBS/Tween and then incubated with serum (diluted 1 : 500) or dilutions of control mouse monoclonal antibody (R&D Systems: 1 μg/ml to 0.1 pg/ml) for 3 hours at room temperature. Plates were again washed with PBS/Tween and bound antibody was detected using peroxidase conjugated sheep antimouse IgG (The Binding Site, Birmingham, UK), and after 1 hour the signal was developed and measured as described above. The control mouse monoclonal antibody was detected down to a concentration of 0.1 pg/ml. Microtitre plates (96-well) were coated with 50 μl of 2 μg/ml CII dissolved in Tris-buffered saline overnight at 4°C. After blocking for 2 hours with 2% casein (200 μl), wells were repeatedly washed with PBS/Tween and then 50 μl of 10-fold dilutions of mouse sera from 1/10 to 1/100 000 000 were applied to the wells and incubated overnight at 4°C. Total anti-CII IgG and IgG isotypes were quantitated using 50 μl of peroxidase conjugated sheep antimouse IgG, IgG1 and IgG2a (The Binding Site) at a dilution of 1/5000 with PBS/Tween. Signal was detected as described above. Each plate included a standard curve of a positive serum obtained from untreated CIA mice at day 40, which was used to define arbitrary units of total IgG, IgG1 and IgG2a anti-CII antibodies. Microtitre plates were coated with 50 μl of capture antibody for IL-4 (rat antimouse IL-4 used at 2 μg/ml; Pharmingen, San Diego, CA, USA) or IFN-γ (rat antimouse IFN-γ used at 5 μg/ml; Pharmingen), both antibodies were diluted with 0.5 mol/l carbonate/bicarbonate buffer (pH 9.6), and plates were incubated overnight at 4°C. Plates were washed with PBS and then blocked with 200 μl of 2% casein solution in PBS for 1 hour at room temperature. Plates were washed with PBS/Tween before incubation of 50 μl of samples and standards (mIL-4 [10 ng/ml to 3 pg/ml] or IFN-γ [300 ng/ml to 100 pg/ml]) for 3 hours at room temperature. Plates were washed extensively with PBS/Tween before incubation with 50 μl biotinylated mouse monoclonal antibody to IL-4 (rat anti-mouse IL-4 used at 0.5 μg/ml; Pharmingen) or IFN-γ (rat antimouse IFN-γ used at 1 μg/ml; Pharmingen). Plates were again washed and then incubated with streptavidin biotinylated horseradish peroxidase complex (diluted 1 : 1000; Amersham Biosciences UK Ltd, Little Chalfont, Bucks, UK). Signal was detected as described above and the limits of detection for the IL-4 and IFN-γ ELISAs were 3 pg/ml and 100 pg/ml, respectively. Descriptive statistics and significant differences between groups were calculated using Student's t-tests for two samples data of unequal variance (Microsoft® Excel 98 software). Transient transfection of Cos-7 cells was used to demonstrate expression of dTNFR from the construct pcdTNFR (Fig. 2). A basal level of TNFR2 was also detected in the control transfection of Cos-7 with pcDNA3, which indicates that the ELISA cross-reacts with the monkey TNFR2 produced spontaneously by this cell line. We previously found that this ELISA reacts with monkey TNFR2 (unpublished data). Expression of dimeric human tumour necrosis factor receptor 2 (dTNFR) from pcdTNFR and pGTRTT transfected Cos-7 cells. Cos-7 cells plated in 12-well plates at 0.4 × 106/well were transiently transfected with 2 μg of the constructs pGTRTT, pcdTNFR, pGTRTEmpty and pcDNA3. Cells transfected with pGTRTT or pGTRTEmpty were either cultured in normal media (lighter bars) or media supplemented with doxycycline (1 μg/ml; darker bars). Levels of human TNFR2 were measured in culture supernatants collected after 48 hours and are expressed as the mean of triplicate values, with vertical lines representing the standard error. Expression of dTNFR from pGTRTT was determined in transiently transfected Cos-7 cells. Induction of transfected Cos-7 cells with doxycycline (1 μg/ml) for 48 hours achieved expression levels of dTNFR from pGTRTT that were equivalent to the levels produced from cells transfected with pcdTNFR (Fig. 2). As previously demonstrated for pGTRTL, there was some basal activity of the Ptet in pGTRTT, with dTNFR expression detected in the absence of doxycycline induction. As expected, the control vector pGTRTEmpty expressed no dTNFR above background in either the absence or presence of doxycycline. Electroporation has been reported to enhance the transfection efficiency of plasmid DNA delivered in vivo by intramuscular injection . In order to confirm this effect in naïve DBA/1 mice, the constitutively expressing plasmid pcLuc+ was injected intramuscularly and electroporated. Measurement of luciferase expression 3 days later indicated that electroporation enhanced transfection efficiency, with expression levels 245-fold greater than achieved with DNA injection alone (Fig. 3a). Constitutive and regulated luciferase expression in vivo. (a) Plasmid pcLuc+ (15 μg) was injected intramuscularly into the right quadriceps of six naïve DBA/1 mice. The muscle of three mice was then electroporated (8 pulses, 200 V/cm, 20 ms duration, 2 Hz), and the other three mice were untreated. Three days later the experiment was terminated and muscle processed for measurement of luciferase. Levels of luciferase are the mean of three animals and are normalized for protein concentration of the muscle lysate. Vertical lines represent standard error, and a significant difference (P ≤ 0.01) between the luciferase level in the muscle of electroporated and non-electroporated mice is indicated (*). (b) Plasmid DNA (15 μg) was injected (intramuscularly) and electroporated in naïve DBA/1 mice. After 2 weeks GTRTL injected mice (n = 5 for all groups) were given 10% sucrose (white bar), or doxycycline drinks (black bars) prepared in 10% sucrose at 200 μg/ml and 2 mg/ml for the subsequent 2 weeks. Luciferase expression in muscle was determined in dissected muscle and was compared with that in mice receiving the control plasmids pGCMV, pGmCMV and pGTL. Significant differences between the pGTRTL plus doxycycline groups and the non-induced pGTRTL group (P ≤ 0.05) are indicated (*). (c) Downregulation of luciferase expression from pGTRTL was assessed in a group of mice that had received doxycycline 200 μg/ml for 2 weeks; they were switched to sucrose for 3 days, after which luciferase levels in muscle were compared with those in groups that were non-induced or continuously induced for the duration of the experiment. A significant difference between the pGTRTL plus doxycycline group and the non-induced pGTRTL group (P ≤ 0.05) is indicated (*), and a significant difference between the pGTRTL doxycycline removed group and the pGTRTL doxycycline 200 group (P ≤ 0.05) is indicated ($). RLU, relative light unit. The self-contained autoregulatory plasmid pGTRTL, which was previously shown to function efficiently in vitro, was assessed for function in vivo following delivery to naïve DBA/1 mice. Expression of luciferase from pGTRTL was compared with luciferase expression from the control vectors pGCMV, pGmCMV and pGTL. In each case, after DNA was injected and electroporated the mice were left for 2 weeks; then those that were injected with pGTRTL either were maintained non-induced with a drink of 10% sucrose, or they were induced with doxycycline drinks prepared in 10% sucrose at concentrations of 200 μg/ml or 2 mg/ml. After a further 2 weeks mice were killed and expression levels of luciferase determined. Results in Fig. 3a confirmed that regulated expression of luciferase from pGTRTL is observed in vivo, with 43-fold and 27-fold induction observed in groups that received doxycycline drinks of 200 μg/ml and 2 mg/ml, respectively. Induced levels of luciferase from pGTRTL with 200 μg/ml doxycycline exceeded the expression levels observed with pGCMV by more than threefold. Interestingly, basal expression of luciferase from pGTRTL was significantly greater than from the control vectors pGmCMV and pGTL. The downregulation of luciferase expression from pGTRTL in vivo was assessed in mice that were untreated for 2 weeks after DNA injection, then induced with doxycycline (200 μg/ml) for 2 weeks, and then had doxycycline removed for 3 days before terminating the experiment. Fig. 3c illustrates that removal of doxycycline for 3 days resulted in return to basal levels of luciferase expression observed for the non-induced pGTRTL group, whereas a group that continued to receive doxycycline for the extra 3 days maintained induced levels of luciferase expression. Control plasmid pcDNA3 (n = 11) or the expression plasmid pcdTNFR (n = 14) were delivered by intramuscular injection and electroporation to arthritic (clinical score at least 0.5) DBA/1 mice on day 27 after CII immunization. Clinical score and hind paw swelling was monitored and is shown in Fig. 4a and 4b. The results indicate that there was no therapeutic effect of pcTNFR treatment. The clinical score of mice at the time of DNA delivery on day 27 was in the range 0.5–4, and a published study indicates that the therapeutic outcome of TNF-α inhibition is related to the level of disease activity when treatment is initiated in mouse CIA . Animals were therefore subdivided into those that had a clinical score of 2 or less and those with a higher clinical score at the time of DNA injection. In terms of clinical score, a significant therapeutic effect of pcdTNFR was observed in mice (n = 6) with lower disease activity at the time of DNA injection, as compared with those injected with pcDNA3 (n = 9), and no therapeutic effect was observed in mice with a clinical score greater than 2 when treatment (pcdTNFR, n = 8; pcDNA3, n = 2) was initiated (Fig. 4c and 4e). Data for paw swelling also illustrate a significant therapeutic effect of pcdTNFR in mice with lower disease activity than in those that had more established disease at the initiation of treatment (Fig. 4d and 4f). Effect of pcdTNFR on progression of collagen-induced arthritis. Development of arthritis was monitored by (a, c and e) clinical score and (b, d and f) hind paw swelling in DBA/1 mice. Treatment was administered after onset of clinical arthritis. All mice injected with pcdTNFR (○; n = 16) and pcDNA3 (□; n = 11) are depicted in panels a and b; those with a clinical score less than 2 at the time of DNA injection are presented in panels c and d; and those with a clinical score above 2 when treatment was initiated are plotted in panels e and f. Significant differences between the pcdTNFR and pcDNA3 group (P ≤ 0.05) are indicated (*). Animals injected with the plasmid pGTRTT on day 27 and administered doxycycline (n = 17) developed significantly reduced arthritis, as measured by paw thickness and clinical score, when compared with control animals that received pGTRTT but no doxycycline (n = 16) and animals that received the control vector pGTRTEmpty and doxycycline (n = 16; Fig. 5a and 5b). When therapeutic effect was assessed on the basis of disease activity at the time of DNA delivery, it was clear that animals with a clinical score under 2 responded to pGTRTT plus doxycycline treatment in terms both of clinical score and of hind paw swelling (Fig. 5c and 5d). Where disease had progressed to give a clinical score greater than 2 at the time of DNA delivery, no benefit of pGTRTT plus doxycycline was observed (Fig. 5e and 5f). Gene therapy treatment of collagen-induced arthritis (CIA) with regulated expression of dimeric human tumour necrosis factor receptor 2 (dTNFR). Progression of CIA was monitored by clinical score (a, c and e) and hind paw swelling (b, d and f) in groups that received pGTRTEmpty plus doxycycline (□; n = 16), pGTRTT without doxycycline (○; n = 16) and pGTRTT plus doxycycline (●; n = 17). Treatment was administered after onset of clinical arthritis. All treated animals are illustrated in panels a and b; those with a clinical score of 2 or less at the time of DNA injection (day 27) are illustrated in panels c and d; and animals with a clinical score greater than 2 at the start of treatment are depicted in panels e and f. Significant differences between the pGTRTT plus doxycycline and the pGTRTT without doxycycline groups are indicated (*P < 0.05, **P < 0.02 and ***P < 0.01). Levels of dTNFR in the serum of pGTRTT treated mice was below the detection level of the ELISA (data not shown), and no antihuman TNFR2 was detected in these sera (data not shown), indicating that the dTNFR was not immunogenic during the time frame of the experiment. The average daily fluid intakes per mouse for the groups in which the treated animals were housed were determined at 3.6 ml, 3.1 ml and 3.4 ml for the pGTRTT plus doxycycline, pGTRTT without doxycycline, and pGTRTEmpty plus doxycycline treatment groups, respectively. The average amount of doxycycline administered was therefore 720 μg in the pGTRTT treated group, which equates to approximately 30 mg/kg doxycycline/day. The anti-CII antibody profile of mice treated with pGTRTT with or without doxycycline and pGTRTEmpty was similar at the end of the experiment for all groups (Table 1). In addition, cytokine release from draining lymph node cells in response to CII or ConA stimulation was also unaffected by any treatment (Table 2). Results are presented from at least six animals in each group. Anti-CII IgG levels in sera collected at the end of the experiment (day 40) was determined by ELISA, with values expressed relative to those obtained for a pooled sample from untreated mice at the same time point. CII, collagen type II. Results are presented from at least six animals in each group. Cytokine release from draining lymph node (DLN) cells was induced by 48 hours of stimulation with CII or ConA and was measured by ELISA. CII, collagen type II. In the present study we demonstrated a therapeutic effect of dTNFR in CIA when expressed from plasmid DNA under the control of constitutive and regulated promoters. Importantly, the therapeutic effect was achieved when DNA was delivered after disease onset, and all of the components for regulated expression were combined in a single vector. We confirmed in DBA/1 mice that electroporation increases transfection efficiency in vivo following intramuscular injection of plasmid DNA, with transgene expression detected beyond 4 weeks from pGTRTL. In agreement with other studies using mice, these observations indicate that there is long-term persistence of plasmid DNA , and expression of the transgene luciferase  and rtTA  encoded by the autoregulatory plasmid. 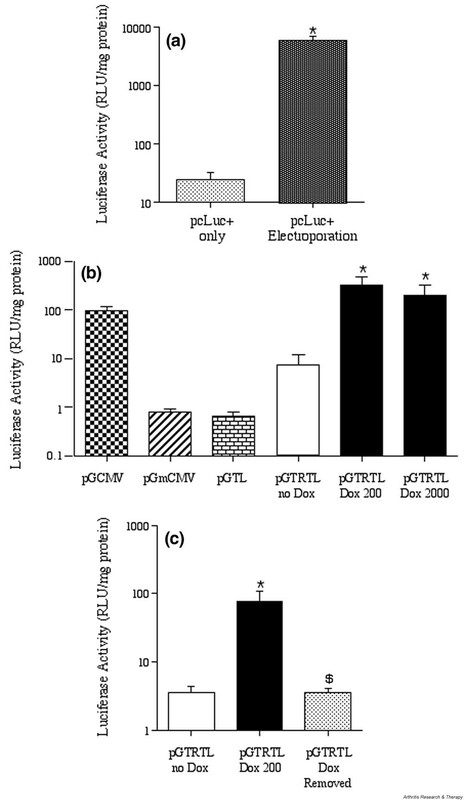 Regulation from pGTRTL in vivo is comparable to in vitro function , as demonstrated by the 43-fold increase in luciferase expression induced by 2 weeks of doxycycline induction, and return to basal expression 3 days after removal of doxycycline. Interestingly, the basal expression from pGTRTL was elevated compared with pGTL in vivo, whereas the basal expression from the two vectors was similar in cultured fibroblasts , which may indicate an effect that is related to expression in skeletal muscle. Improvements in the tetracycline system have led to the development of tetR targeted repressors such as tetR–KRAB  and tTS , which have been shown to reduce efficiently basal expression from the Ptet regulated promoters in vitro and when codelivered to skeletal muscle [26, 27]. Incorporating the tetR-KRAB gene into the self-contained plasmid would reduce basal expression and increase the magnitude of regulation, as was recently achieved with an adenoviral vector . According to data obtained in clinical trials, transfection of human skeletal muscle with injected plasmid DNA does not appear to be as efficient as in mice because only short-term transgene expression has been demonstrated . Enhanced transfection efficiency by electroporation has yet to be conducted in humans, but observations with primates indicate a beneficial effect . The tetracycline gene regulatory system has also been demonstrated to function in primates, but there is evidence of immunogenicity in this species . Although the components of the system may also be immunogenic in humans, further research will be needed to determine whether regulated expression of an immunomodulatory cytokine enables transfected cells to evade detection by the immune system. Constitutive expression of therapeutic genes has been utilized extensively and successfully in experimental gene therapy. However, for clinical application regulated promoter systems are more flexible because they enable the level of expression to be controlled and provide a means by which to terminate gene expression. These features are likely requirements for gene therapy application in chronic relapsing conditions such as RA. Although the present study demonstrates the effectiveness of the pGTRTT autoregulated vector, the full utility was not harnessed because dTNFR was continuously induced. More stringent examination requires the use of chronic arthritis models such as CIA in Vβ 12 T-cell receptor transgenic mice  and use of therapeutic molecules that actually reverse established disease, for example IL-4  and IL-1 inhibitors [22, 33]. In the present study the therapeutic effect of dTNFR was clearly demonstrated in CIA when expressed from plasmids with constitutive or regulated promoters, but in both cases the therapeutic effect was related to the disease severity at the time of DNA injection. The first reports of anti-TNF-α treatment by protein therapy in CIA indicated that therapeutic effect was observed when anti-TNF-α treatment was initiated before disease onset [34, 35] or immediately after onset . The therapeutic effect of anti-TNF-α in CIA was later shown to relate directly to the stage of CIA development at the time treatment was initiated, with maximum effect achieved when treatment was started just after disease onset. The effect was less when administered 2 days after onset and it was ineffective when treatment was started 7 days after onset . Essentially, where disease activity was lower anti-TNF-α was beneficial, but when disease was more advanced TNF-α inhibition was ineffective. This is akin to observations in our gene therapy experiments. By contrast, anti-TNF-α therapy causes a reversal of chronic symptoms in a large proportion of RA patients, which clearly highlights a differential outcome from anti-TNF-α therapy in CIA and human disease. The tetracycline system has previously been utilized in CIA gene therapy for regulated expression of vIL-10 [27, 36]. In one study  regulated expression of vIL-10 was achieved by injection of two adeno-associated virus vectors intramuscularly before immunization of DBA/1 mice, and doxycycline administration started 23 days after immunization. The study conducted by Perez and coworkers  involved coinjection of a single plasmid from which vIL-10 was regulated, along with a plasmid encoding the transcriptional silencer tTS. Doxycycline and plasmids (intramuscular and electroporated) were both delivered before onset of disease and resulted in a modest delay in onset and reduced incidence of arthritis. Doxycycline is reported to have direct effects on inflammatory processes, which theoretically could be of direct benefit in the treatment of arthritis. In vitro studies have shown that doxycycline inhibits bone and cartilage breakdown , inhibits matrix metalloproteinases (particularly the activity of matrix metalloproteinase-13 and -8 against CII ), increases inducible nitric oxide synthase mRNA degradation , and induces Fas/Fas ligand mediated apoptosis of activated T cells . However, these effects of doxycycline in general have a 50% inhibitory concentration in excess of 10 μg/ml, whereas maximal activation of the Ptet occurs at a concentration of 1 μg/ml. Indeed, no beneficial effect of doxycycline treatment with the control vector pGTRTEmpty was evident in this study, and a recent clinical trial showed no benefit of doxycycline treatment of RA patients . However, the tetracycline analogue minocycline administered at a similar concentration (800 μg/ml) to that used this study was beneficial in adjuvant arthritis and CIA in rats . When anti-TNF-α treatments were initiated before onset of disease in CIA and in transfer models of arthritis, effects have been observed on disease severity [4, 34, 35, 43, 44]. Changes in immune response were also noted, including reduced proinflammatory cytokine production, anti-CII antibody levels in sera , and changes in anti-CII immunoglobulin isotype ratio [45, 46], indicating a downregulation of the T-helper-1 response. When gene therapy has been started at the onset of disease, the therapeutic effects of anti-TNF-α have been less consistent. 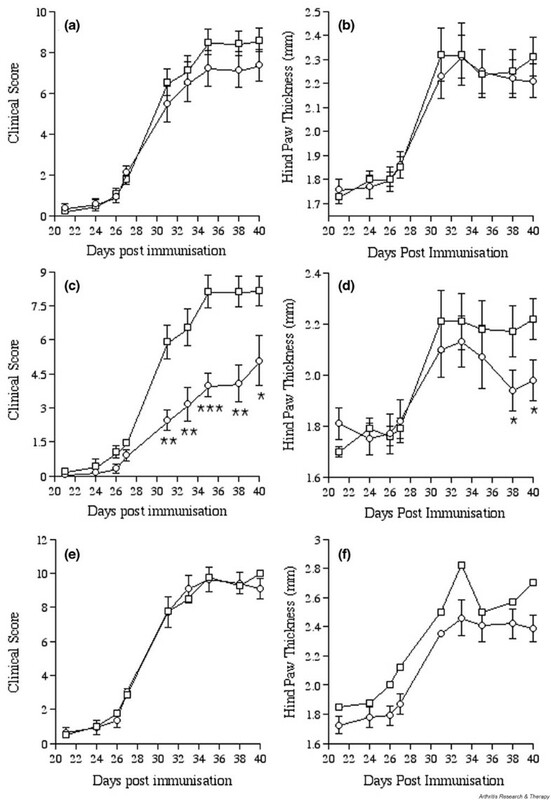 Expression of a dimeric chimeric human TNFR1–IgG fusion protein from adenovirus was effective in a rat CIA model when delivered intravenously after onset (low level) of disease, but it was ineffective when delivered intra-articularly . In mouse CIA, intravenous administration of adenovirus encoding the same dimeric TNFR1 molecule at onset ameliorated disease development for 10 days and was followed by rebound exacerbated disease . Injection of retrovirus encoding TNFR1–IgG peri-articularly at the onset of disease inhibited its progression . Injection of retrovirally transduced syngeneic fibroblasts encoding dTNFR at onset of CIA did not prevent disease development . These previous studies used viral vectors, and in this regard our study is the first to observe a therapeutic effect with a TNF-α inhibitor expressed from plasmid constructs. Few studies have examined the effects of anti-TNF-α on the immune system when treatment commenced at or after the onset of CIA. 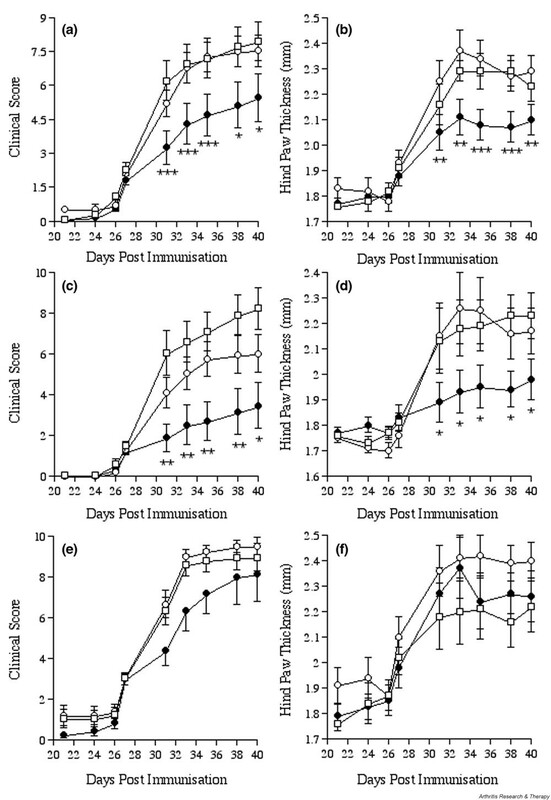 Expression of dTNFR from fibroblasts injected at CIA onset did not alter anti-CII levels , while expression of TNFR1–immunoglobulin following injection (peri-articularly) of encoding retrovirus at onset in arthritic paws has been reported to reduce anti-CII levels, particularly IgG2a, at 7 days after onset . We were unable to show any effect of dTNFR treatment on anti-CII levels or cytokine expression from stimulated draining lymph node cells. Although we examined immunological markers at a similar time point as did Muhkerjee and coworkers , we used different TNF-α inhibitors, vectors and routes of delivery, and we initiated treatment after disease onset. The observation that expression of dTNFR for 13 days in the CIA experiments was not immunogenic is encouraging. In RA patients there has been no report of immunogenicity against Etanercept®, which also contains the extracellular domain of the human TNFR2. By contrast, expression of TNFR1–IgG encoded from adenovirus in mouse CIA led to the development of autoantibodies to mouse TNFR1 . There was some evidence that these antibodies had agonistic TNF-α activity in vitro, and the immunogenicity of the TNFR1–IgG was associated with the rebound exacerbation of disease that was observed. The overall picture that emerges is that before disease onset inhibition of TNF-α can inhibit disease development by targeting the immune response. But after onset of disease the target for TNF inhibition is to block the cascade of inflammatory cell recruitment and for optimal effect the inhibitory molecule should be delivered as soon after disease onset as possible. This study illustrates the potential for performing gene therapy with a single injection of regulated vector in CIA. Improvements in plasmid delivery and gene regulation may permit adoption of a similar therapeutic approach in RA patients in the future. In the present study we inhibited disease progression in established CIA with dTNFR expressed from plasmid DNA in a constitutive or regulated manner. Response to anti-TNF-α therapy occurs in a large proportion of RA patients. However, in CIA inhibition of TNF-α is less potent. In the study we showed that inhibition of disease progression, by a plasmid encoding dTNFR, is mainly observed when the arthritis score is low at the start of treatment. Regulated vectors are powerful tools in gene therapy but will require stringent long-term testing in chronic models of disease in order to demonstrate their full potential. Plasmid delivery of therapeutic molecules such as TNF-α inhibitors represents a feasible and simple gene therapy approach for RA treatment and demands further improvements in gene regulation and methods of delivery. We thank Dr Richard Williams for critical reading of this manuscript. The research was funded by The Arthritis Research Campaign UK and by the European Union grant FP5-QLK3-CT02-02039.